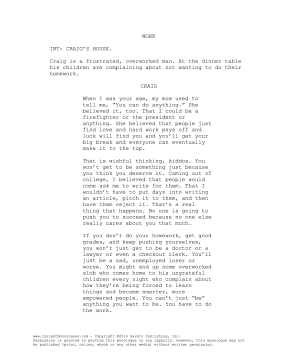 A middle-aged male actor gives this 1-2 minute dramatic monologue to his ungrateful children. Craig is a frustrated, overworked man. At the dinner table his children are complaining about not wanting to do their homework. When I was your age, my mom used to tell me, "You can do anything." She believed it, too. That I could be a firefighter or the president or anything. She believed that people just find love and hard work pays off and luck will find you and you'll get your big break and everyone can eventually make it to the top. That is wishful thinking, kiddos. You won't get to be something just because you think you deserve it. Coming out of college, I believed that people would come ask me to write for them. That I wouldn't have to put days into writing an article, pitch it to them, and then have them reject it. That's a real thing that happens. No one is going to push you to succeed because no one else really cares about you that much. If you don't do your homework, get good grades, and keep pushing yourselves, you won't just get to be a doctor or a lawyer or even a checkout clerk. You'll just be a sad, unemployed loser or worse. You might end up some overworked slob who comes home to his ungrateful children every night who complain about how they're being forced to learn things and become smarter, more empowered people. You can't just "be" anything you want to be. You have to do the work.